Upwell is situated on the very western border of Norfolk, in the West Norfolk local government district. It is a large parish, criss-crossed by drains and fens and dominated by agricultural land. To the north, the village of Upwell straggles along the old course of the River Nene, and runs almost seamlessly into the northern parish and village of Outwell. The name ‘Upwell’ is derived from the Old English for settlement up the stream. As well as the village of Upwell, there is a small area of settlement called Lakesend at the very south of the parish. Evidence for human activity during the prehistoric period is not dense, probably due to the heavily waterlogged state of the area before drainage. A few worked flints (NHER 37156) as well as a Neolithic scraper (NHER 49032) have been recovered. From the Bronze Age a spearhead (NHER 28067) has been recovered, and of particular interest are a group of ring ditches and a possible barrow at the very southern tip of the parish (NHER 2477). The fact that there have been no Iron Age objects recovered is made even more surprising by the sheer density of monuments and objects recorded from the Roman period. Aerial photography, largely dating to the 1970s, and fieldwalking during the Fenland Survey of the 1980s has greatly contributed to our knowledge. As a result a large number of features have been mapped from the aerial photographs, though many remains of uncertain date. 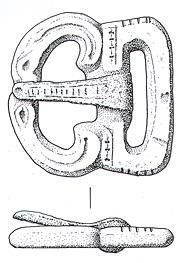 A number of the features, such as the ring ditches and circular enclosures (NHER 2489, NHER 4221, NHER 35497) may date from the prehistoric period, but require further expert analysis before a firm date can be attributed. These features are distributed across the parish, and include field systems (NHER 2477), trackways (NHER 35498, NHER 2492) and enclosures (NHER 36720, NHER 35497), possible Roman roads (NHER 11869, NHER 36719), as well as potential areas of settlement (NHER 12855). The density of these marks is surprising, but should be considered in context with the presence of the Roman Fen Causeway (NHER 2796), which runs roughly east to west and cuts the parish across the middle. The Fen Causeway is a Roman road that runs from a junction with Ermine Street and King Street near Peterborough though the Cambridgeshire and Norfolk fens, eventually splitting to terminate in Venta Icenorum at Caistor St Edmund (NHER 9786) and Brampton (NHER 1006, NHER 1124). In Denver there is extensive evidence of salt production (NHER 4240) near the Fen Causeway, and that is also a feature of Upwell. Ten individual sites have been noted where the briquetage remains associated with salt production have been recovered (NHER 25065, NHER 24387, NHER 24388). In addition, some contain possible settlement evidence, such as floors (NHER 2481) and human remains (NHER 2474). There have also been numerous examples of common Roman objects recovered from across the parish. These include coins (NHER 4216, NHER 31929, NHER 31837), pottery sherds, (NHER 41358) and metal objects such as buckles (NHER 25843). Of particular interest are a Roman ceremonial lead hammer (NHER 29193) and the fragments of a copper alloy bowl (NHER 12612). Saxon evidence is often more rare than Roman, particularly in excavations. However, archaeological investigation in a small area near to the River Nene (NHER 40128) revealed a number of ditches and pits, one of which could be dated to the Late Saxon period. Pottery sherds (NHER 41359), as well as brooches (NHER 41358) and other metal objects (NHER 29193) have also been recovered, as well as a fragment of silvered and decorated copper alloy sheeting, which was probably part of an enamelled hanging bowl from the 7th century (NHER 31929). At the heart of medieval society was the church of St Peters (NHER 4225). The earliest buildings on the site can be confirmed to date to the 13th century, although these were redeveloped from 1310, when the present nave was begun. Only the tower survives, though like the rest of the church it has been subject to Victorian restoration. St Peter’s does retain an original octagonal 14th or 15th century font, as well as a 14th century lectern and two early 15th century brasses. Indeed, there are a number of buildings in the parish that may be associated with ecclesiastical activity. As well as the church there was a chapel to St Botolph (NHER 25840), although both the building and the exact location have been lost. Also lost is the Marmont Priory building, a small Gilbertine priory or chantry that was founded in 1203, although the site and a number of architectural fragments have survived (NHER 25832). Also potentially associated with religious activity are The Cottages on Town Street (NHER 25845), which originally formed part of a the front range of a single large 13th century building, which may have been a lodging or warehouse associated with one of the sixteen religious houses that owned land in Upwell during the medieval period. Excavation on the site has also discovered evidence for earlier structures on this site. Indeed, Upwell is lucky in its surviving medieval buildings, for part of another 14th century building has also survived as a wall in a builder’s merchant on Town Street (NHER 46876). Also of importance to the medieval life of the parish was Welle Manor Hall (NHER 22171), originally a late 14th century hall house. It was modified in 1480 and surprisingly is constructed largely from brick, with more recent slate and tile roofs. Of the earlier periods, a full height porch dating to 1480 and a gabled porch to the south with a 15th century polygonal full height stair turret, survive, as does an ornate 15th century doorway from the porch into the hall. To the north the two octagonal late 15th century brick towers, with their original brick staircases, are all that remains of the original wall. As well as buildings, there are a number of landscape features thought to date to the medieval period. These include ring ditches probably used as drainage for haystacks (NHER 36708, NHER 36723, NHER 36709), as well as some drainage ditches (NHER 38184). Perhaps most significant are the Well Creek canal, built at some point before the 13th century, and the New Podyke constructed in 1422. Objects from the medieval period are also numerous, including pottery sherds (NHER 37156, NHER 29193), whole pots (NHER 17406), metal objects (NHER 49081, NHER 44622) and coins (NHER 49047, NHER 44622). The same variety of objects have also been recovered from the post medieval period, though they are less numerous. Of particular interest is an area of gunflint debris (NHER 25081), and two post medieval horse skeletons (NHER 15143) that were recovered whole from the fens and are believed to have drowned in situ. The sites of a number of post medieval drainage mills have also been recorded (NHER 14511, NHER 25834), as has the site of the more recent North District Pumping Station (NHER 40094), a drainage pump initially run by a steam engine. Associated with all of these are the water courses of Popham’s Eau (NHER 4223), built by Sir John Popham in the 17th century, and London Lode (NHER 29549), also constructed in the 17th century by the London Merchants. Of even more recent date are two pillboxes (NHER 32358, NHER 32362) and two anti-tank emplacements (NHER 32357, NHER 32361), as well as a Cold War Observer Corps site (NHER 35432). Pingle Bridge (NHER 43177), which was built in 1936, should also be noted as it represents one of the earliest examples of this form of reinforced concrete structure.